In Australia we are very lucky to have the Bureau of Meteorology (BoM) who collect weather data from hundreds of stations around the country. Even better, they now compile this data and make it available online. In the 1990s solar insolation[*] was added to the historical figures for rain, temperature and so on. So for most weather stations we now have at least a decade’s worth of data to rely on for our calculations. 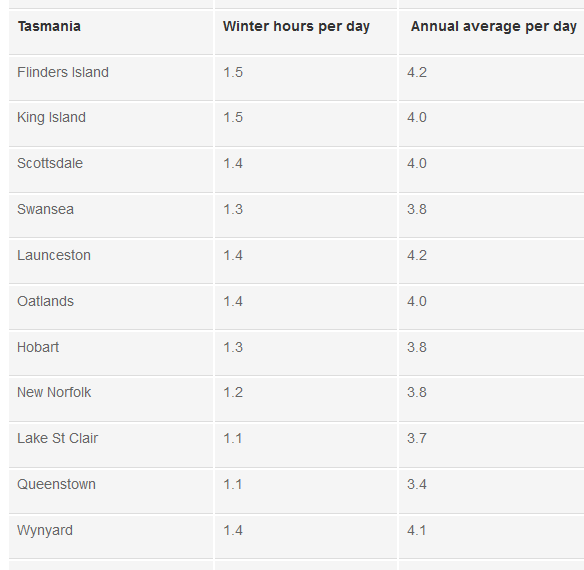 I’ve summarised this solar data in a table which covers a range of towns in each state. 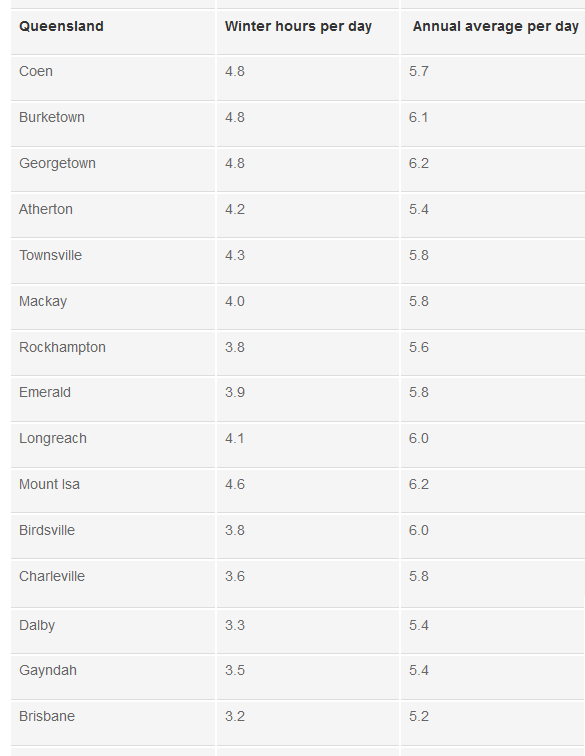 There’s also a step-by-step guide to using BoM’s online tool to get figures for more specific locations. 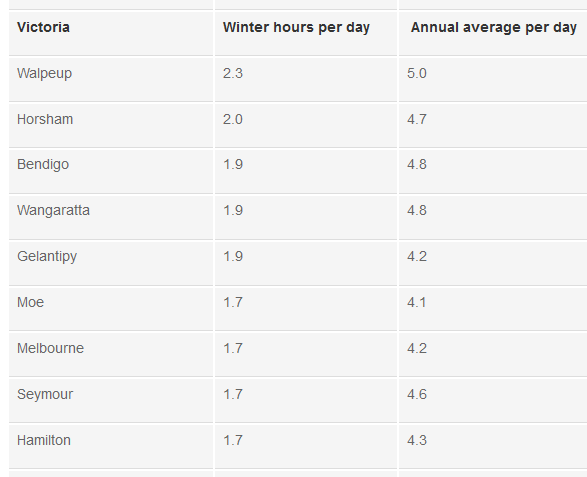 The table has solar data for the winter hours of sun, plus the Annual average. So if you like to get about at all times of year, and want to have enough solar even when the weather is not at its best, then using the winter hours will give you what you’re after. However if you prefer to avoid travelling and camping in the winter months, then it’s probably okay to use the average annual figure for solar. Personally I prefer to design my 12Volt systems using winter-hours. That way I know that I’ve got all the bases covered, just in case we do hit a patch of “winter-weather” in spring or autumn. BoM describes their figures as the daily solar input on a 1m² horizontal surface. This means that if we have a 100 Watt solar panel, and we place it flat on the ground, we will get the equivalent of 100 Watts for the number of hours given in the table. Some also call this Peak Sun Hours (PSH). For instance if we look up Perth then in winter we will get 2.6 hours of peak sun on our 100W panel, so we will get 2.6hrs x 100Watts = 260 Watt-hours per day. This can be improved a bit by angling the panel towards the sun, and in Australia this will face us in the general direction of North. 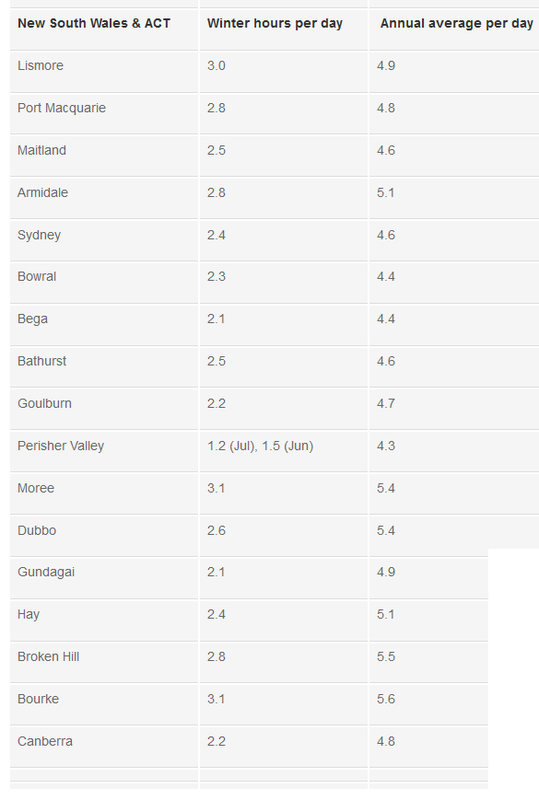 The figures in the table are averages that BoM calculates from observations over many years. I’ve chosen towns in BoM’s major weather regions, to cover most eventualities. 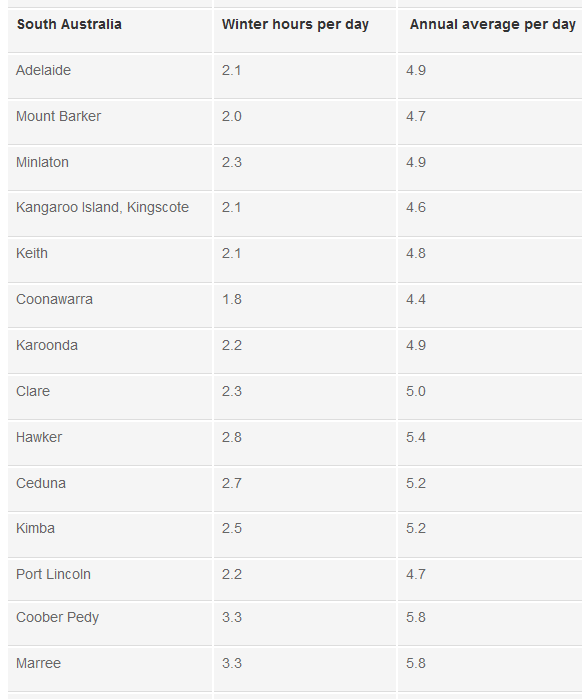 If you are in a specific location that is not mentioned in this table, there is a guide to using the BoM “Climate Data online” at the end of the table. This could be for systems like a weekender or other fixed off-grid systems. By using a more exact location you can narrow down your solar input more accurately and size your system for better cost efficiency. 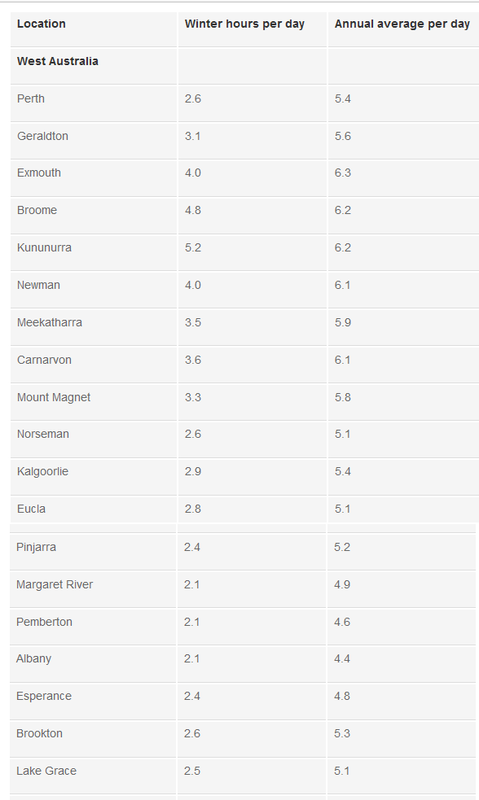 Otherwise the towns in the table will get us near enough for most locations especially if you’re travelling. As we mentioned at the beginning, if you are looking for the solar data in a specific location, then the online tool from BoM has access to a whole heap of data for places all over Australia. So below is a step-by-step guide to using this online resource. Now at Select a weather station in the area of interest, do just that – type in a location that you’re interested in. If it’s not in the BoM database (or misspelled) it will come up with: No town name matches your search. Otherwise it will give you a range of options that match what you’ve typed in. For instance if we are looking for Perth (in WA), it will give us options that include Perth in NSW and TAS (yes, I didn’t know they existed either) plus a whole bunch of weather stations nearby. Scroll through the whole list to make sure you’re actually getting the weather station you want, and then choose one. It will then give you a second list of Nearest Bureau stations and how far away they are from the town you chose before. Again, choose one that best suits your location. It will then liven up the bit at the bottom of the screen Get the Data and give you the Station Number. Click on the button for Get Data. On the right of the page, about 100mm down, is a radio-button (that’s what it’s called) for Units that gives you the choice of MJ m¯² or kWh m¯² (m¯² is the same as “/m²” and both are “per square metre”). Choose kWh m¯² and you’ll see all the numbers change – by magic! Now scroll down to where you see a table for Summary statistics for all years. These are the averages (mean) for each month, over all the recorded years, plus the maximum and minimum ever recorded at that station, for each month. On the right you’ll also see a column headed Annual, which shows the average solar hours over the whole year. The figure we are most interested in is the mean for June, because that is our worst-case month for the year[†], and if we design for that worst-case then we’re safely planning for our solar system to keep going in all weather conditions[‡]. If you’re in any doubt at all, about which figure to use, just use the figure for June and you’ll end up with a solar system that will be a pleasure to use, summer, winter, whatever! [*] Technically, Insolation is the power received on Earth per unit area on a horizontal surface. The BoM website has some useful definitions and for our purposes Solar Insolation is the same as Global Solar Exposure. [†] The worst-case month is June at nearly every station I’ve looked at so far (and I’ve seen a few!). 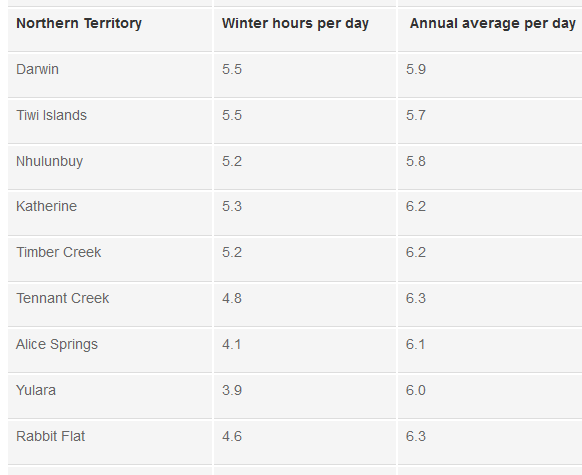 One exception is Perisher Valley, NSW, with its minimum in July. If anyone comes across another one where the lowest figure is a month other than June, please let me know, I’d be most interested! [‡] The hawk-eyed among us may point out that if we really want to plan for the worst-case, then we should actually use the minimum solar ever recorded for June. I have to agree, but I’d point out 2 things. First, BoM’s weather records started quite recently, so the minimum solar prior to BoM’s measurements might have been even lower. Second, the worst-case month, averaged over all the years, seems a pessimistic enough worst-case to satisfy even the most cautious among us.